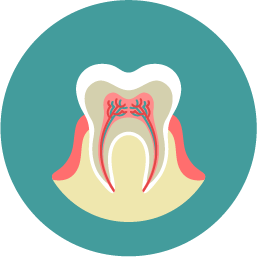 Our teeth are composed of three layers, the outermost layer being the enamel. The middle layer is dentin and the inner layer is called the pulp. The pulp chamber and root canals contain nerves, blood vessels and connective tissue. Infection. If a cavity is left untreated, the decay continues to spread. The decay will spread through the enamel and dentin layers, into the pulp. Once it reaches the pulp the only way to treat the infection is root canal therapy. Antibiotics cannot cure infection inside the pulp chamber and root canals. Trauma. When the pulp is exposed due to a fractured or broken tooth. Past Trauma. Trauma does not always result in a broken tooth, but over time a tooth that has once encountered trauma can slowly die and will need root canal therapy. Many times when a tooth is dying or dead it will discolor, turning a darker color than the surrounding teeth. Death of Tooth. Sometimes teeth die for no apparent reason. This may be the most irritating because there is no visible explanation for it, but they too need root canal therapy. Some signs and symptoms to be aware of: sensitivity to heat, sensitivity to pressure, discoloration of the tooth and/or swelling near the tooth. These may indicate a problem and should be evaluated by Dr. Seneczko. When root canal therapy is needed it will show up on a periapical x-ray. A periapical x-ray shows the entire affected tooth, from crown to root tip. An infected tooth needing treatment looks different on the x-ray than a healthy tooth. The area surrounding the root tip(s) of an infected tooth is much more olucent, or dark, because of the surrounding infection. This indicates that treatment is needed. The affected tooth will be isolated using a rubber dam. This thin plastic shield helps keep the area dry during the procedure. A small hole will be drilled into the tooth until the pulp chamber is reached. Once the pulp chamber is reached, many specialized instruments are used to remove the infected tissue and clean out the canals. It is very important that every bit of nerve tissue is removed. An x-ray will be taken to check the progress. This will show if further removal of nerve tissue is needed. After all infected pulp and nerve tissue is removed, a rubber-like material called gutta purcha is placed inside the pulp chamber and canals. This will seal the inside of the tooth. Lastly, a temporary filling is placed to close off the access hole. This filling is indeed temporary. Many times after root canal therapy the tooth will need a crown. Once the nerve tissue is removed, the tooth is dead and becomes brittle. A crown is often needed to protect the tooth from breaking or cracking, although there are some instances where a permanent filling will do just fine. Many times Dr. Seneczko will perform root canal therapy in the office. If she thinks that it would be better handled by an endodontist (a dentist specializing in diseased pulp tissue), she will not hesitate to give you a referral.